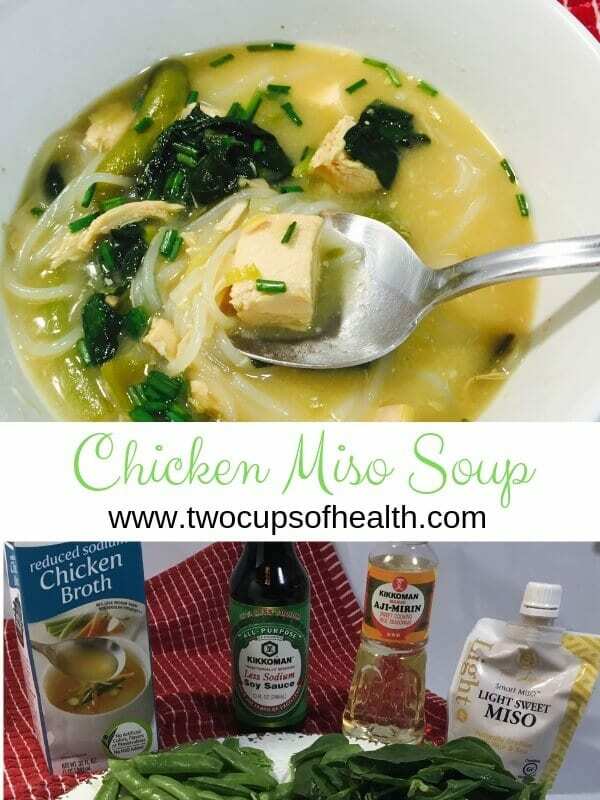 This delicious recipe for Chicken Miso Soup is both easy and over flowing with health. It’s soup time and I have to say I’m delighted about that. Soup to me says comfort, a warm hug and calm in the midst of a storm. Like this Chicken Miso Soup. I love the holidays, but with shopping, wrapping presents, sending cards, throwing parties and extra cooking, along with all your regular duties, it does get to be a bit stressful. It shouldn’t, because this is a wonderful time of the year, but it does. So, in the midst of chaos, take time to be good to yourself. And to your health. Like do some diaphragmatic breathing, and maybe some Tai Chi. Harvard recommends it highly for stress! And be sure you add lots of nutrients into your diet. Dr. Andrew Wild has said that the two diets he recommends overall for longevity is the Asian Diet and the Mediterranean Diet. Totally different and yet similar in the fact that both diets are vegetable forward with some meat or fish. This Chicken Miso Soup is exactly that. 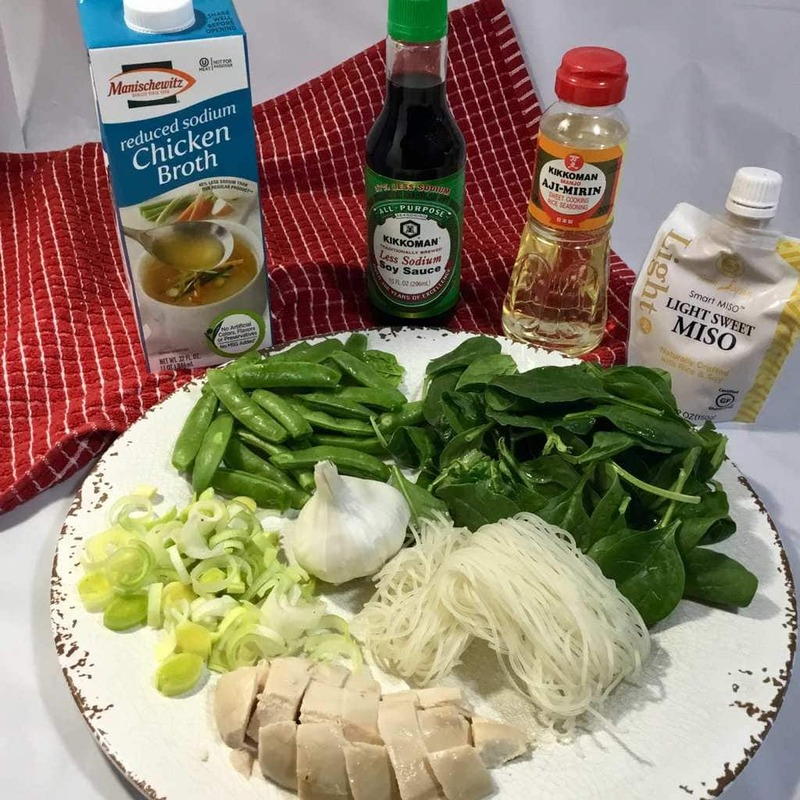 Some chicken for protein, but lots of spinach, leeks, snap peas, miso, ginger and garlic, along with rice noodles all nestled in a perfectly spiced broth. 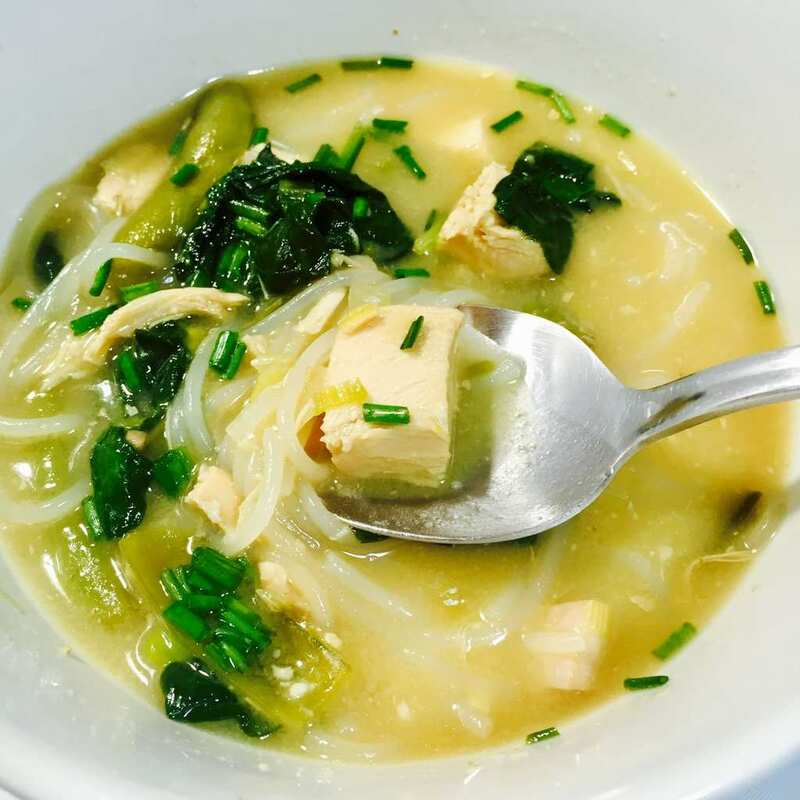 My book, Natural Healing Foods, goes into detail about the health benefits of each of these foods, but overall this soup helps fight stress, colds, cancer cells and helps keep your heart healthy. Not bad for a bowl of total deliciousness. Whenever I add chicken to soup or the slow cooker, I always caramelize it first for extra flavor. I know it’s one more step, but totally simple to do and it just makes a difference in the total taste. Just dredge the chicken lightly in a flour, garlic salt and pepper mixture and add it to a large soup pot, with a little oil, over medium high heat. Cook the chicken about 3 minutes on each side just to get it a little brown and to help seal in the juices. Then add garlic and ginger and cook 1 minute. Next add the Mirin, sugar, soy sauce, and the chicken broth. Be sure an use a good low sodium chicken broth like Manischewitz. It’s the best really and tastes rich like home made. Turn the heat down low and let those flavors simmer and come together about 20 minutes. Then remove the chicken from the pot and cut it into bite size pieces. Add it back to the soup pot along with the rice noodles and cook 5-7 minutes more until the noodles are just al dente. You can buy these rice noodles in the pasta section of your market. They come in convenient portion sizes of rice noodle bundles. I added 4 bundles. Finally add the snap peas and the leeks. Let them cook for only 2 minutes, so they will impart the flavor, but at the same time remain structurally intact. They will be crisp tender at this point. Just before serving add in the spinach and the miso. Cook 1 minute as you stir the miso into the soup, then ladle the soup into bowls. Garnish with some chopped chives. 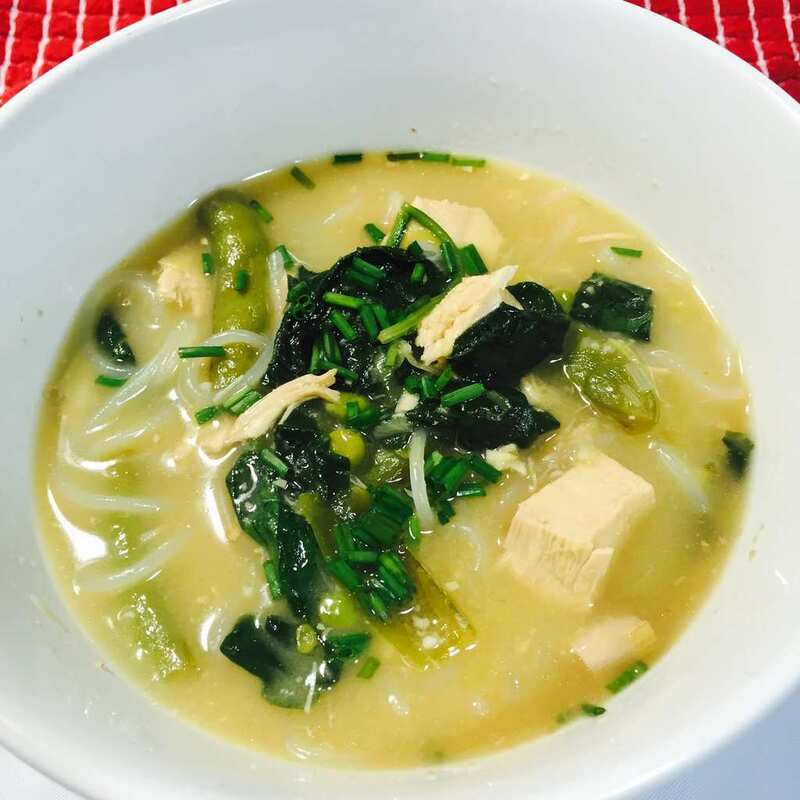 This delicious Chicken Miso Soup is both easy and over flowing with health. Exactly what your family needs during the stress of the Season. Cut chicken thighs into 1" cubes and sprinkle with garlic salt and pepper. Add oil to a large soup pan over medium heat. Add chicken and cook for 3 minutes until browned. Add garlic and ginger and cook for 1 minute. Then add Mirin, sugar, soy sauce and chicken broth. Turn heat to medium low, cover and allow to simmer 20 minutes. Add in noodles and allow to cook for 5 minutes. Finally add sugar snap peas and leeks. Allow to cook for 2 more minutes until snap peas are crisp tender. Just before serving add in Miso and baby spinach and ladle into bowls. If you like this recipe, leave a comment below and be sure and pin us on Pinterest.